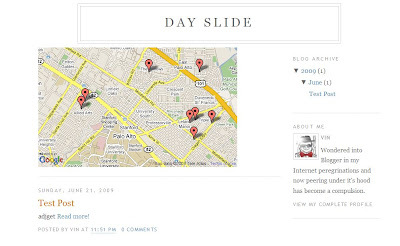 Google Map with Markers in Blog. ~ The Blog Doctor. You are here: Home > Google Map > Google Map with Markers in Blog. Google Map with Markers in Blog. STEP 1. Get a Google API key for your blog. In the first step you have to generate a Google API key for your blog here. Put a check in "I have read and agree with the terms and conditions (printable version)" box by clicking it. Paste your blogspot URL in the text box and click Generate API Key button. Copy down the key generated. STEP 2. Modify the Template Code. Click Edit HTML subtab of Layout tab. STEP 3. ADD HTML GADGET in sidebar. Click Layout link on Dashboard under blog title. Click Add Gadget link on Page Elements subtab of Layout tab. 1. Paste in the Google API key obtained in Step 1 where it says "PASTE_YOUR_GOOGLE_API_KEY_HERE". 3. The above code will add 10 markers at random locations. For more information checkout the Google Maps documentation. Thanks for giving a step by step instruction to add google markers in our blog but i am not able to modify the template code i have already tried more than 4 times but no solution of this problem. I think more easily, we do edit on the google map, then we'll take the link in the form of an iframe? After you consultancy my blog is get well very fast.Thanks for so profession consultancy.